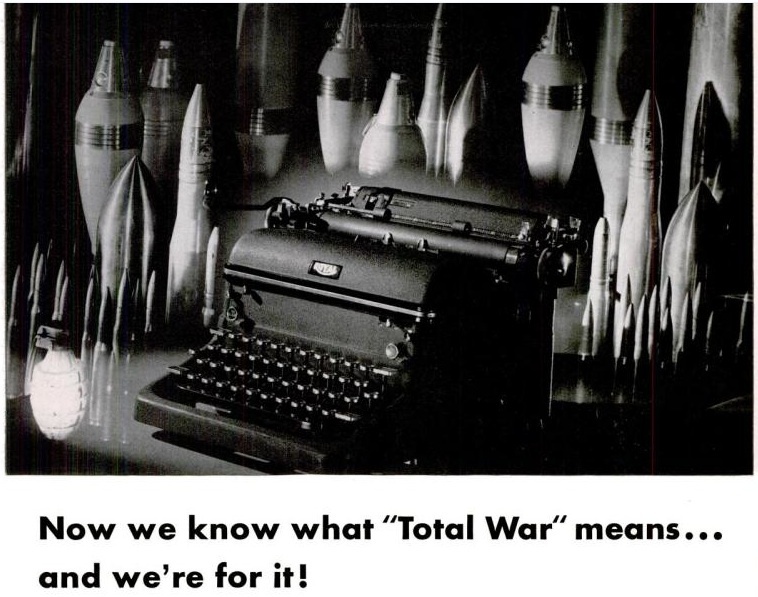 In honor of Memorial Day I wanted to look back into Royal's war-time advertising past. Royal's wartime advertising is interesting. 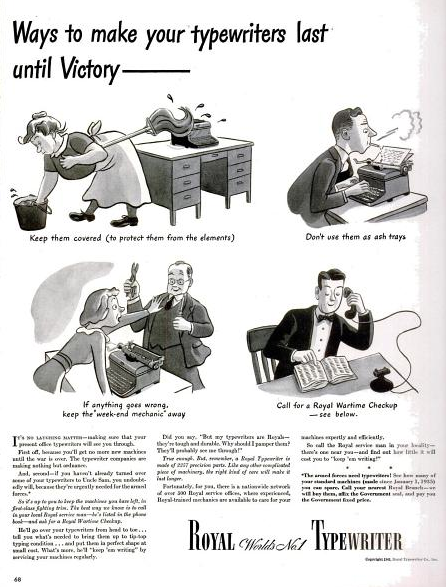 Shortly after war was declared the company followed the tenor of the nation and ran patriotic advertisements. The first two full-page ads (below) come from early 1942 and are the most overtly patriotic. As time went on, though, Royal knew that it must keep its product line in the mind of a population who couldn't buy them. The war stretched on and the Royal's advertising changed focus from patriotic populism to helpful and informational ads. The remainder of the ads I have posted are these information type. In the middle of the war Royal started pushing their Roytype ribbons and carbons. I am sure that management knew that they could not count on war profits forever. They would need to grow the business in the only way they could until production picked up after the war. 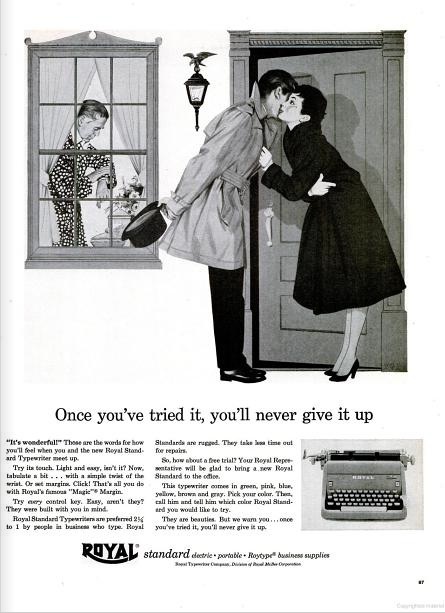 This push for revenue from accessories is not seen from Smith-Corona. 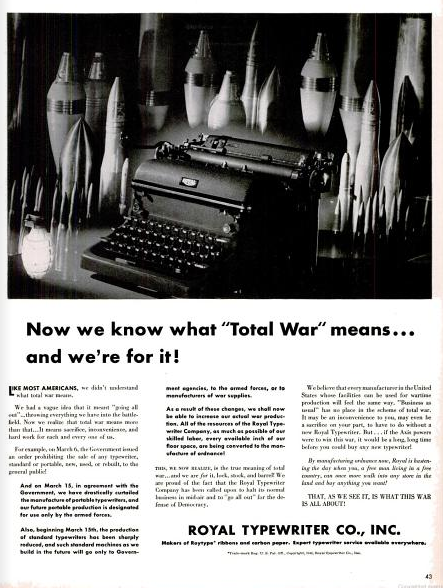 Smith-Corona did run wartime advertisement, but the tone of SC's work was more patriotic throughout the war. They did not work on the pushing branded accessories and authorized repair centers. I don't even know if SC had their own ribbon and carbon paper brand. Regardless, the efforts of Royal's Madison Ave. wizards must have paid off because Royal was very successful after the war. They were so successful, that McBee, Litton, and Olivetti all purchased the company albeit at different phases in its history. 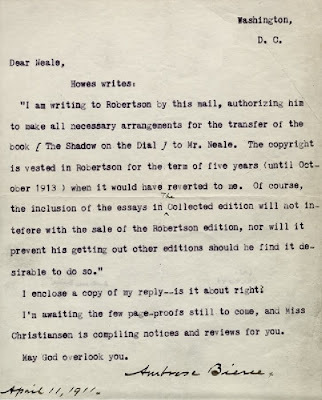 In a 1916 article from the magazine America, there is a summary of an argument made by Mr. Thomas L. Masson in a paper he wrote for another magazine called Bookman. His idea is that if Milton used a typewriter to write "Lycidas" or "Hymn on the Nativity", these poems would not be as good. Pen and paper, apparently, are the only way for an author to slow down and revise. 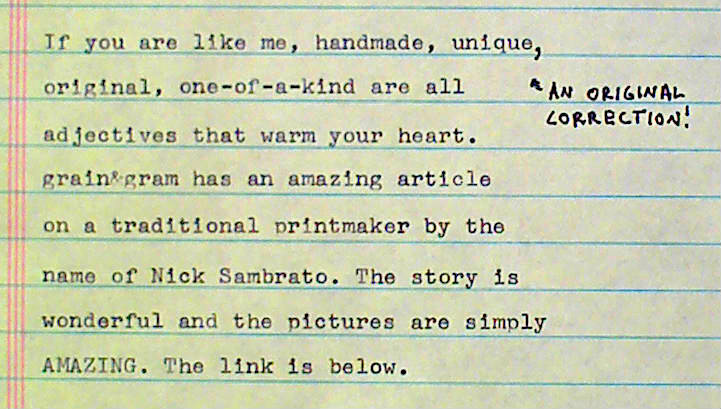 It's fine to use the typewriter to "conform more closely to our modern standards of orthography" but the use of one for composition is met with the invective, "Perish the thought!" 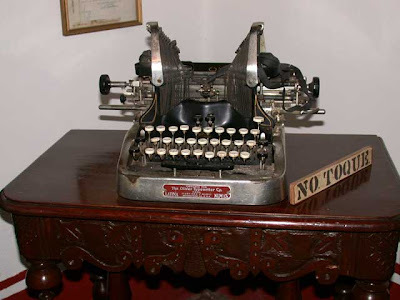 The entire idea of this blog is that the typewriter is an excellent way to compose writing. I (and others) actually believe that it is the superior way to compose writing. The computer marks a "crisis in the history of letters." With the speed of creativity no one takes time to slow down and work on writing. Revision is passe'. 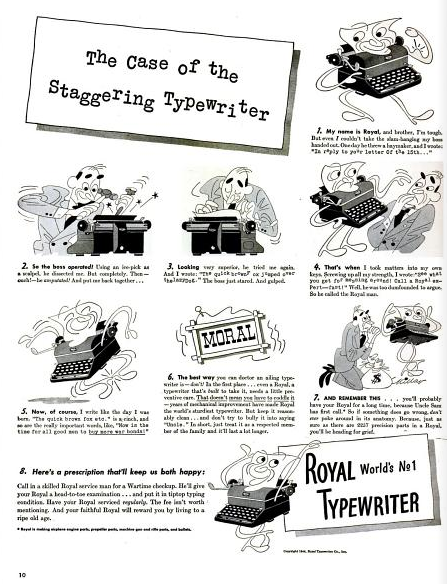 The typewriter offers a way for an author to select words carefully without the harsh distraction of the modern computer. 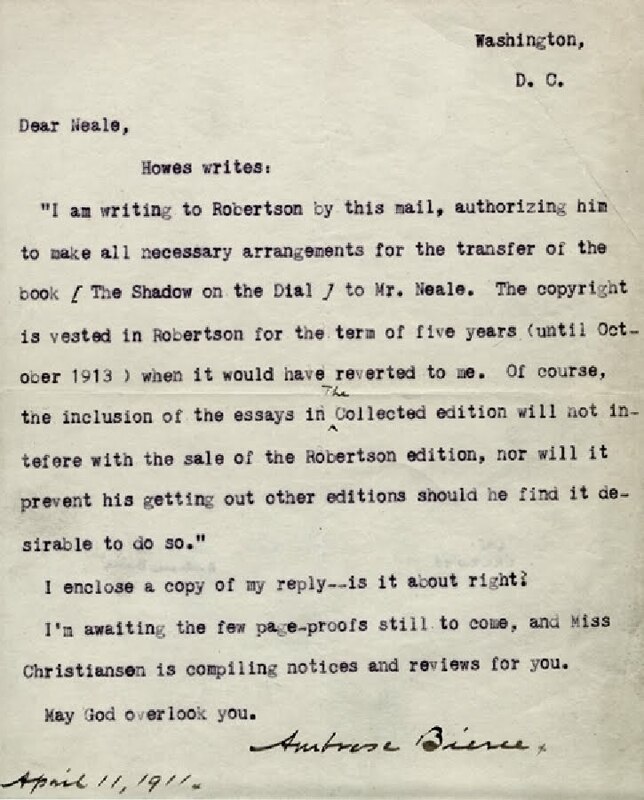 Well, reading this column I can see that the concern over the typewriter edging out the traditional way of writing was a concern to early twentieth-century litterati. Is it natural that every iteration of technology causes people to worry about losing some ineffable quality of an older method? Did writing strike fear in the heart of the Chavet-Pond-d'Arch painter? Did movable type strike fear in the heart of the Lindsfarne monks? If you want to read the entire column...read on, Macduff! I found this in an old Saturday Evening Post. I wonder what the machine the story is referencing? I think it might be a Williams, but I am sure there were a number of machines that used an ink pad. What's more frightening is how modern this experience sounds. I have been thinking about the Royal Model O that I posted about Sunday evening. I am an unapologetic Royal fan. I have alluded to this before, but it wasn't until the Model O came into the collection that I have really come to an understanding of what makes Royal so special. Royal, as a company, never set the world on fire with any feature. If the ads that Royal ran in Life are any indication, Magic Margin (after which this blog is named) was their proudest accomplishment. 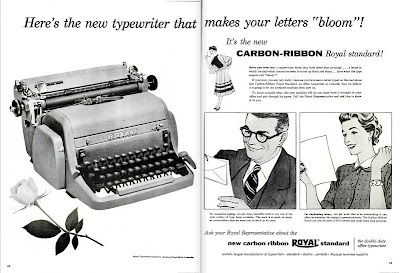 That's a little sad because I have always felt that Royal's margin system was a little over-designed and far from the greatest addition to the world of typewriters. It's more magical if you could figure out how it works. Touch-Control might pop your mind as being something entirely special, but key tension adjustment can be found on many typewriters of the time. It's not the styling that marks them unique. Every industrial designer at Royal must have shopped at the same Brooks Brothers because there is nothing daring about any Royal design. Even when daring is attempted it's done as if someone had suggested that cocktails be served a three instead of four. Scandalous! No there is something else that makes the Royal special. That "it" factor is gravitas. Royals are weighty. Serious. They are as frivolous as a chartered accountant. You can ever go wrong with a Royal and if you do it's your own fault for not being serious enough. 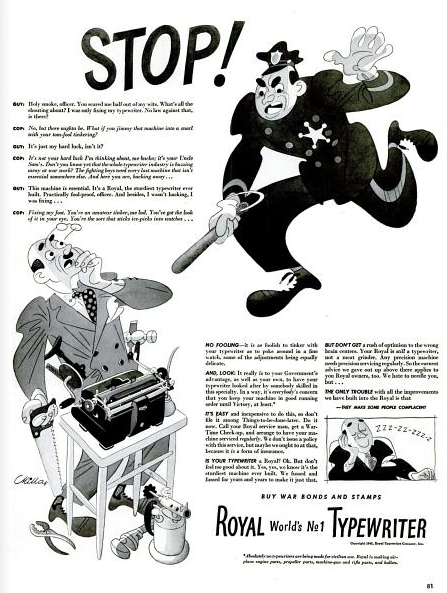 As seen in the advertisement from a 1942 Life, Royal's and serious things like war are synonymous. 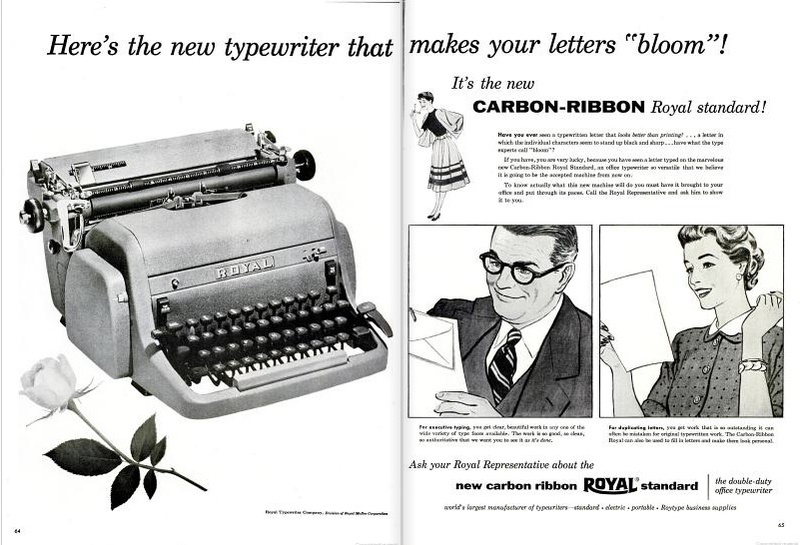 Would you want some little Smith-Corona or a pipsqueak Underwood doing war business? I don't think so. Next time you find a Royal in a thrift store, don't discount it because of some fictional (yes, I refuse to believe the problem exists) escapement problems. They are wonderful serious machines. So, the other typewriter that I received this weekend was a beautiful model O. It's in great shape too and even came with the original instruction booklet. (I'll scan it soon.) It works well and has a very small typeface. Enjoy these photos. Even includes a mint instruction booklet. Actually, it looks as if it new. Beautiful paint and bright nickel accents makes this machine look very fancy. It's in absolutely pristine condition. This machine came with another Royal portable that I will post later. It also is in great shape. What's amazing is that there is very little yellowing of the keys. As you can see above, they have stayed uniformly white. Wonderful machine. I think I'll expand this post a little later, but in the meantime I hope you enjoyed the pictures. If you've read once, you've read a thousand times that I love the Royal Standard HH. 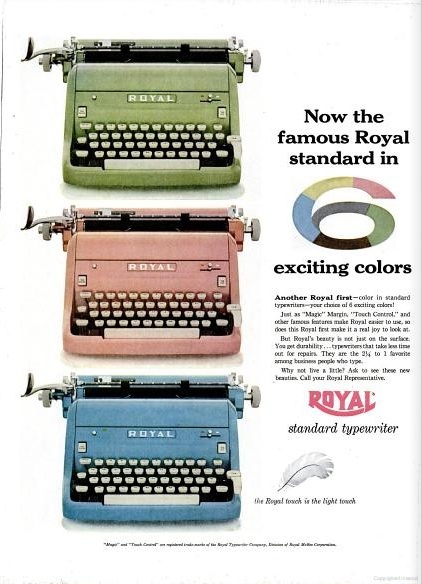 Apart from being the most amazing standard desktop machine, it was also the subject of some of Royal's most mid-century advertising. Each one is rife with the subtle sexism of the decade, but it makes them no less enjoyable. So, please enjoy this little gallery. 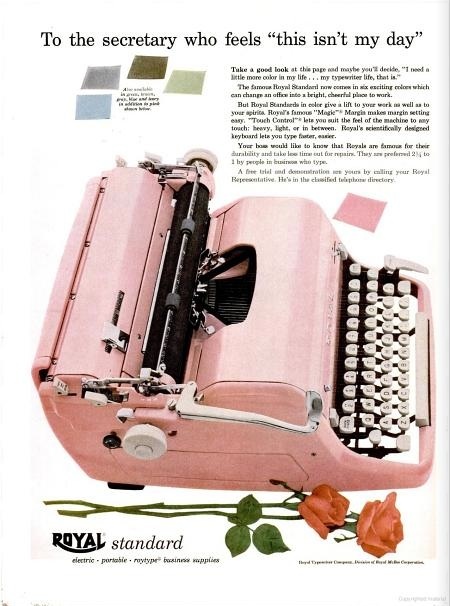 Pink typewriters improve office morale! Is it a little troubling that I want one in each color? Put an HH on the back of your Vespa and that'll be the end of you. 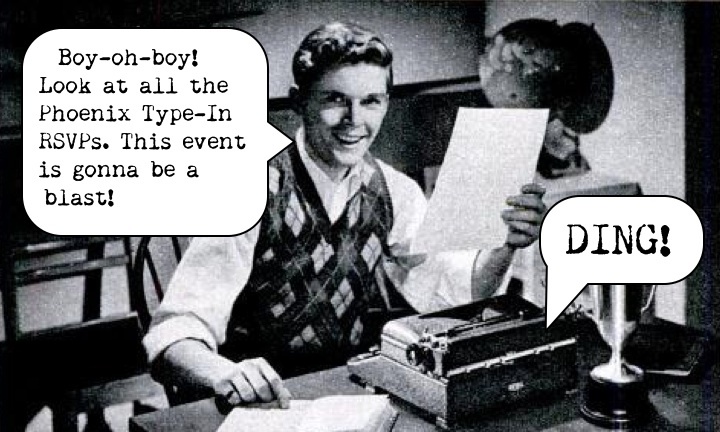 Yesterday my email account had four RSVPs for the﻿ Typewriter Round-Up. So far it looks like we are on-track for almost twice as many as the last event! 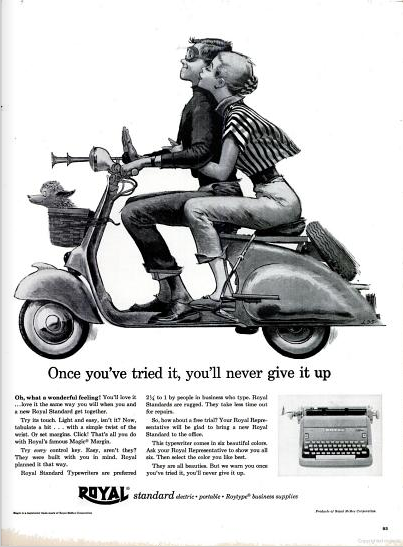 There is no holiday for the typewriter! As the regular school year winds to a close, the Classroom Typewriter Project winds to a close too. 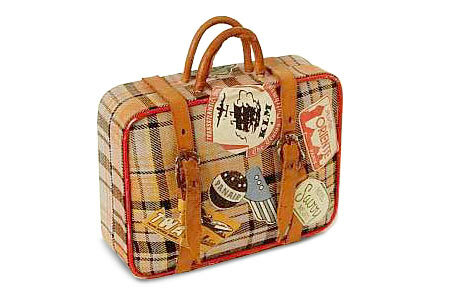 I've started dusting typewriters, taking out ribbons, and packing up the typewriters in their cases. All of this work was going fine until I found out that I was hired for summer school. This means that the machines will get some use in the month of June. Summer school in our district is credit-recovery, so the class will be filled with Juniors and Seniors who happened to fail the first semester of Junior English. Right now, I have 18 registered and that means we will be nearly 1:1 in terms of typewriters. With this kind of typewriter to student ratio I can start to really construct an idea of how low-performing students can benefit from using a typewriter in class. There is a type of writing instruction called Writer's Workshop. The idea of this pedagogical approach is to give the students greater freedom in selecting the subjects for their own writing. Academic and creative writing are given equal weight. 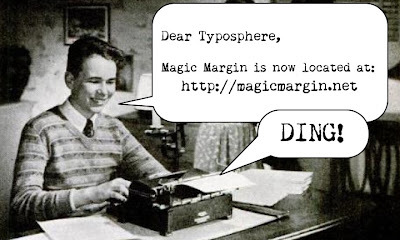 I think that this is how we will approach writing this summer, but I am going to add the typewriter twist. Workshop does contain a reading component, however when it comes to literature, we will keep it traditional. The summer might be time off for some, but in my little classroom you will still hear the clack of typebars. I guess I better start unpacking those typewriters. When you know where the keys are you can focus on the writing rather than where the letters are. Isn't that question mark great? Bill Wahl, a local typewriter celebrity, was featured on a segment on Arizona Highways TV this Sunday evening. Take a look at the video embedded below. 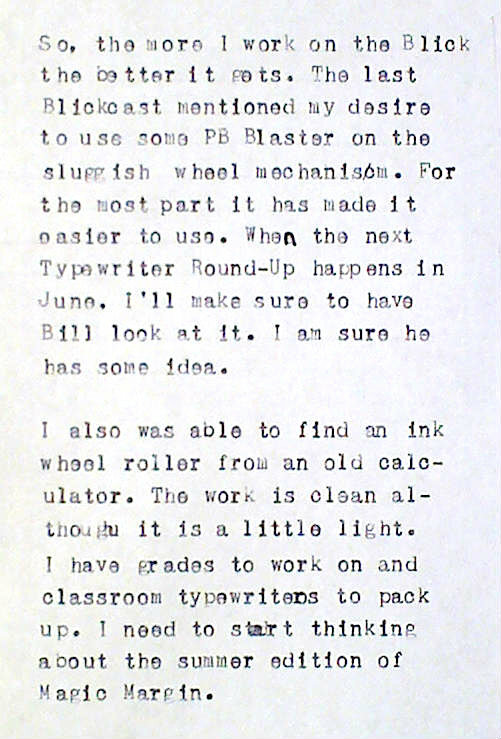 Maybe someone can tell what type of typewriter he used, but it's clear that Bierce was comfortable using one. He even makes a typo by omitting a word. That makes me feel good. I am sure that by 1911 using using a typewriter to write wasn't that unusual. 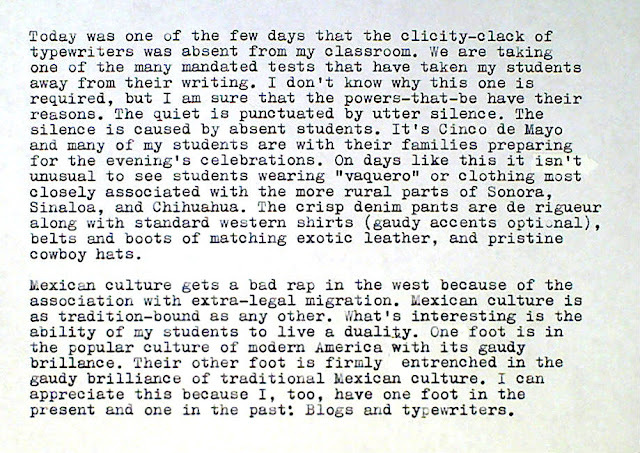 But not many authors were embedded in Panco Villa's army in Mexico. Oliver realized that Mexico had been overlooked in the market and sent a man by the name of Parker to change that. 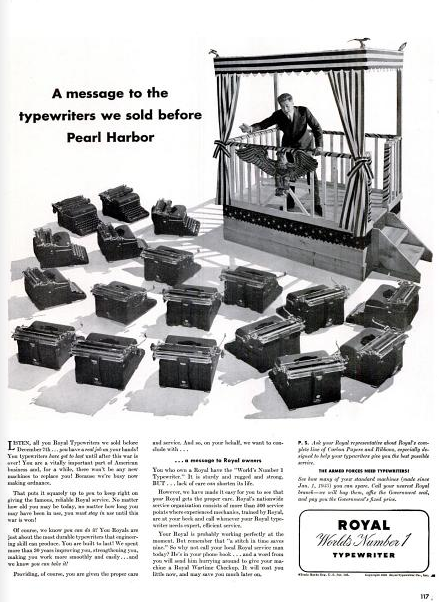 Parker was able to introduce the country to the typewriter and the Oliver. 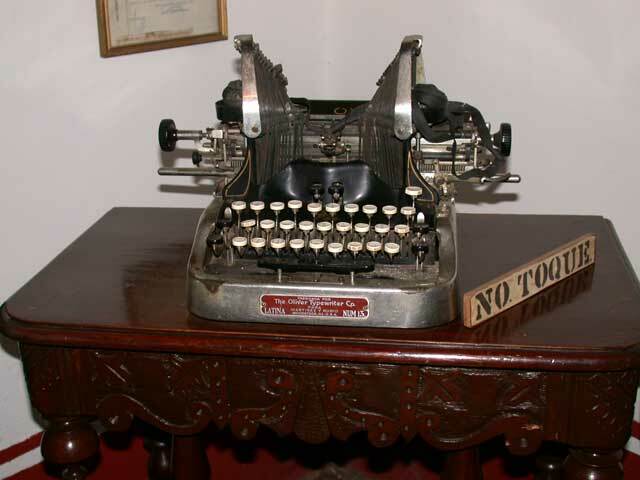 At this point in 1911 if you wanted to buy a typewriter in Mexico it's likely you were buying an Oliver. They were used in all levels of the post-revolution republic. LC Smith did have some offices, but I think many companies were more concerned over the perceived danger of early republican Mexico. 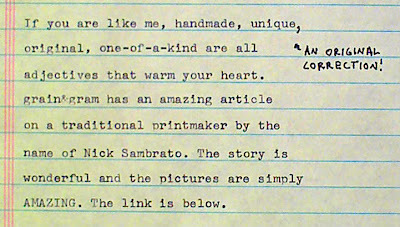 Richard Polt has a blog post about a nickle LC Smith that includes a mention of nickel Olivers. The mystery is: did Bierce use a nickel Oliver or did was he supplied a typewriter by his American editors? I am going to investigate this information further. It should be interesting whatever I discover. Take a look at AZ Teen Magazine's list of the hottest 100 students and teachers and you will find me listed among them (page 28). I posted about this a while ago, but the magazine has just published. You can see the print version by clicking the image of the cover to the left. I will be signing typewriter's in my classroom after school. You know, because I am so famous and everything. and Hermes, winged sandal shod. 1:30 will be fine enough. It will be sunny, Hey! lest thou be a human square.